Fiscal cliff news has the market set to gap up strongly this morning. The 1st day of the month is often a strong one for stocks, but how has it done intraday when it gapped up big to begin with? That is what I looked at this morning. 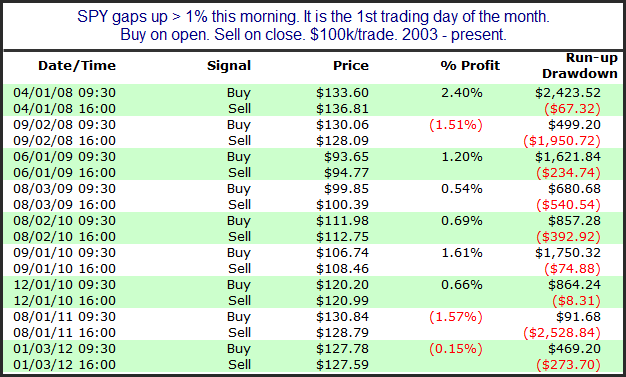 6 of the 9 instances since 2003 have closed above the open. Gross gains have been about 2.2 times the size of gross losses, and the average trade rose a little over 0.4% from open to close. But with instances low I wouldn’t put a lot of faith in these numbers. Early indications favor more upside but it is certainly not a clear-cut edge.